On Wednesday South Africa's home affairs minister Nkosazana Dlamini-Zuma became the latest senior figure in the ruling African National Congress party to add her voice to the growing chorus of officials calling for greater state involvement in mining reports Business Day. 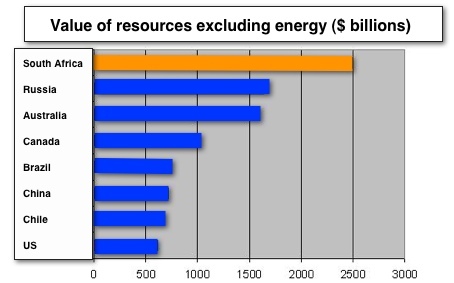 "We should take control of our natural resources. We should beneficiate and also ensure that we do get sufficient benefit from these mineral resources," Dlamini-Zuma told delegates to an African leaders conference in the nation's capital. "At the moment, the company doing the extraction, (the) beneficiation, gets the resources and gets the financial benefit while the countries and its people receive very little," she said." Dlamini-Zuma, who is a favourite candidate to take over as chair of of the African Union and is also the ex-wife of South Africa's president Jacob Zuma, made her comments one day after all three major global ratings agencies – Fitch, Moody's and Standard & Poor's – placed South Africa's credit rating on negative outlook, a move that raises borrowing costs for government and the private sector and has the potential to scare away investors. The Independent quoted Carmen Altenkirch, sovereign director at Fitch Ratings, as saying the possibility of nationalization of the African country's resource sector played a big part in the decision: "The failure to put a nail in the coffin of nationalisation and agree on a way forward for the mining sector will continue to harm a sector that has already suffered from a lack of policy clarity." At the ANC's policy conference of last week the party said it would not be pursuing the nationalisation of mines – mostly because the state is not able to afford it – but calls for seizure of assets from influential factions within the ruling alliance, including the radical youth wing, only became louder. The ANC will elect new leaders in December and final decisions on state intervention in the mining sector would probably only be made then. The ANC has put forward a windfall tax of 50% on "superprofits" as an alternative to nationalization and has vowed greater intervention in the production and export of strategic minerals – specifically platinum. South Africa’s output from mining shrunk almost 17% in the first quarter of this year on the back of strikes and shutdowns at platinum mines. The mining sector in South Africa contributes 9.6% to GDP and employs 3.1% of the country’s labour force. In 2010 the sector contributed 15.3% of country’s exports. 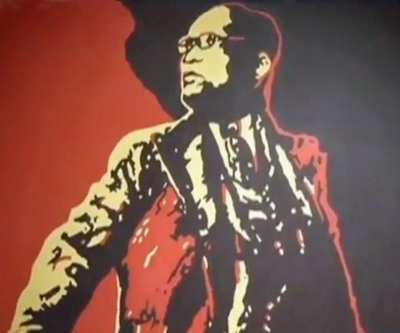 Image is of controversial painting of South African President Jacob Zuma mimicking a Soviet-era poster of communist leader Lenin.